Do you want your child to overcome his fears and become more relaxed and active? Then sign it up for a 2-day intensive seminar “Improviser”. The goal is to intensively help the child cope with the clamps, develop creativity, show their individuality and establish communication with other children. The child will expand the fantasy card, will better understand himself and others. 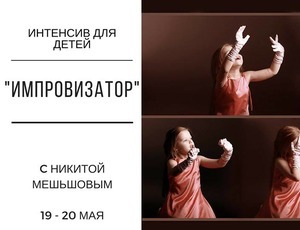 Intensive will be held in a playful, accessible form for children. With the help of diving games, children will develop their imagination, which develops the child’s creative talent and memory. Various exercises for emancipation will help gain confidence not only in public performances, but in life. Nikita Menchov – Founder of Big Improv Studio, Ambasador Improvisation in Russia, which before Russia was trained in the USA, China, Japan, the Philippines, and Dubai. He started and conducted more than 8 courses in such countries as Russia, Kyrgyzstan and Vietnam. He is the only Russian member of the Canadian Institute of Improv-Actors iTi, as well as a participant in many international projects in the field of contemporary theater, film and television. Places are limited! The event is in Russian without translation.